Now in limited releases from Well Go USA Entertainment, South Korea’s latest domestic hit, GONJIAM: HAUNTED ASYLUM (which outpaced READY PLAYER ONE in its opening week at the country’s box-office) uses smartly measured scares and state-of-the-art technical showmanship to upload new life into the outdated found-footage Horror genre. Though the found-footage film is a largely American phenomenon, with the rise of live-streaming and YouTube celebrities, it was only a matter of time before “the world’s most wired nation,” (one which lists gaming/internet addiction among its major public health crises) joined the LAN party. 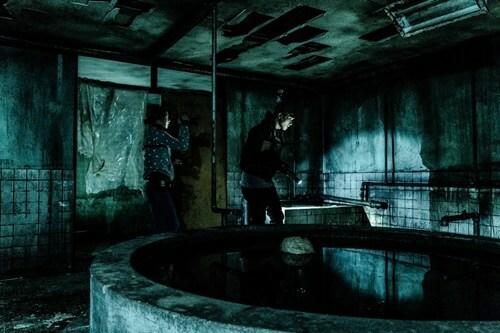 GONJIAM: HAUNTED ASYLUM is only one of a handful of the country’s efforts in this vein (after 2010’s THE HAUNTED HOUSE PROJECT and 2016’s HIDE AND NEVER SEEK) but manages to update and streamline a genre that often feels chained to handhelds and webcams. Writer/director Jung Bum-Shik (EPITAPH, HORROR STORIES) kicks things off with an iPhone shot viral video of two teens encountering a ghost in a madhouse. The video is being relayed by Ha-Jun (Wi Ha-Jun), a view-hungry vlogger who runs the “Horror Times” YouTube channel. He explains that the footage is from the abandoned Gonjiam Psychiatric Hospital, one of Korea’s most haunted landmarks made famous by CNN’s “7 of the freakiest places on the planet” list in 2012. Ha-Jun recruits a group of young people (Park Sung-Hun, Lee Seung-Wook, Oh Ah-Yeon, Park Ji-Hyun, Yoo Je-Yoon, Mun Ye-Won) to spend a night in the asylum in a live-streamed event meant to land the channel advertising deals. After a raucous first meeting and and a toast to “a million views,” the adventurous seven set off with a busload of equipment to capture some bona-fide paranormal activity. The “Horror Experience Squad” is equipped with drones, GoPros, handheld cameras, surveillance cameras, and even one that shoots VR. Every member of the group is oufitted with a shoulder-mounted, dual-purpose camera that captures both their POV and reaction shots. As the live-feed gets rolling, the group splits into pairs, which each tackle one of the hospital’s four floors while Ha-Jun directs the action off-site. This tour is supposed to culminate in the opening of the mysterious, sealed, room 402, but the spectral denizens of Gonjiam have other plans. The attractive and likeable cast is made up almost entirely of unknowns, each using their own names. The actors themselves shoot the bulk of the footage, which is interrupted only by the to and fro switching of camera perspectives (at Ha-Joon’s whim) or the “Horror Times” stinger to punctuate the action. The lack of a score adds to the film’s verisimilitude and though it wasn’t shot within Gonjiam itself (the current owner of the building actually filed a lawsuit in a failed attempt to stop the film being shown in theaters) Bum-Shik’s naturalistic approach likely makes this journey into terror even better than experiencing the real thing. The closest analogue to GONJIAM: HAUNTED ASYLUM’s tech-happy take on found-footage is Adam Wingard’s noisy and overproduced remake, BLAIR WITCH (2016). Though that flick featured a similarly assorted selection of filming techniques, these never gelled organically with the storytelling itself. Unlike filmmakers Eduardo Sánchez and Daniel Myrick’s BLAIR WITCH PROJECT (1999), which famously used the limitations of their chosen medium to increase tension, Wingard’s rehash seemed to strain against the mobile cameras used, viewing them as a stopgap for their professional-grade counterparts and rendering them little more than a gimmick. Jung Bum-Shik leans into these same technologies–fully exploiting their strengths and embracing their inherent drawbacks–giving the viewer a realistic, compelling, and unsettling experience in the process. There’s plenty of humor in the film’s early scenes, and seeing the adventurers attempt to maintain a professional air while narrating their experiences through their nerves gives the setup a welcome dose of relatability. When the scares do come, the shoulder-mounted cameras are as much a part of their efficacy as the understated effects themselves, and the cast sells the material admirably for being so green. Bum-Shik smartly adds another layer of human drama to the proceedings that also recalls THE BLAIR WITCH PROJECT: monomania. Horror films often have to wrestle with the “why don’t they just leave” issue, and the director covers this base with the age-old vices of greed and obsession. Ha-Jun is GONJIAM: HAUNTED ASYLUM’s resident Ahab, those one-million views are his white whale, and the Horror Experience Squad his foolhardy, expendable crew. In recent years, found-footage Horror has grown stale. With laptop-bound frighteners like UNFRIENDED and gentle satires like CREEP oroborous-ing the genre with self-reflexivity, South Korea’s GONJIAM: HAUNTED ASYLUM is a lean and mean feature that proves the increased mobility of the personal camera need not preclude the art of scare making. Using the urban legends surrounding the long-abandoned Gonjiam Psychiatric Hospital as a jumping off point, director Jung Bum-Shik treats his audience to an immersive and thrilling tour through “1 of the 7 freakiest places in the world.” Unlike so many movies that exist in the THE BLAIR WITCH PROJECT’s sizable shadow, it shrewdly takes elements and themes from it and updates them for our current digital age: reminding us that the glow of new technology just makes the dark seem darker, and that “doing it for the “Likes”‘ will, more often than not, leave you black-eyed and gibbering while ghosts kill all your friends.